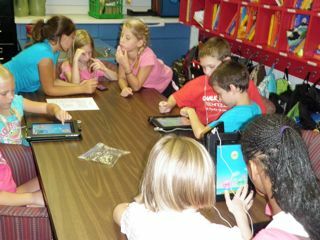 On Friday, our technology buddies from Mr. Murray’s second grade class paid us a visit. 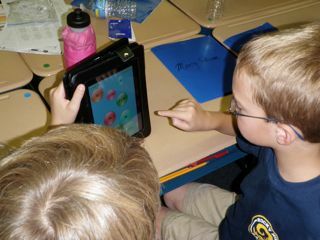 During our time, the 5th grade students showed the second graders some of the apps on the iPads and iPod Touches. 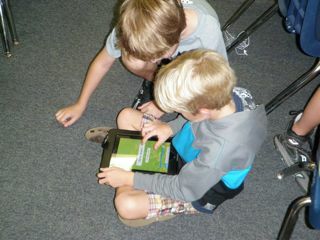 Next, we had a class competition on Pop Math. 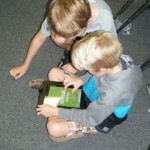 A great math app where students have to pop a matching answer to a problem. Example, a balloon has the equation 4 + 5 on it and the students have to find the matching 9 numbered balloon. When they make a match, it pops both balloons. You win by popping all the balloons on the screen and you move to the next level. To finish the lesson, the students created their own martians and gave them names. It was a great way to end a great week. My students are already looking forward to next Friday’s meeting. Last week, we received our letters and videos from our friends from the Philippines. It was an amazing experience watching my students read letters from students who live on the opposite side of the world. The students enjoyed finding similarities between them and the students from the Philippines. 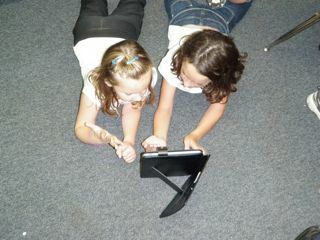 After reading the letters, we made a video, wrote letters back, and looked up their school on Google Earth. I remember doing pen pals with schools from the next county and I thought it was the coolest thing. 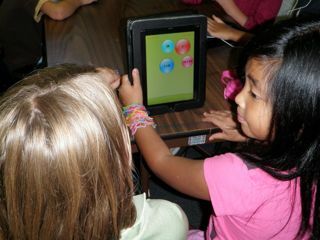 Now with the help of technology, students can meet and see where other students live thousands of miles away. 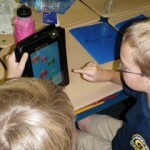 With the help of the new technology, my first day with my students went fantastic. I have never had students so excited about being in my class. I asked the class if any of them had trouble getting to sleep last night due to excitement and almost ever student raised their hand. Even though today was the first day, I am just as excited about tomorrow when the students will start going through the new routine with the added in technology. For example, on tomorrow’s schedule we are reading on the iPad, taking a Mr. Haney quiz with the iPod Touches, naming our fish, creating our novel study wikis, and using a virtual cell app to help with our science vocabulary just to name a few and this is only the first day! I am so thankful for ORAU’s gracious donation, and if the rest of the year is anything like today, it is going to be a year to remember! Yesterday was one of the greatest days I have ever experienced not only in my teaching career but my life. The day would not have been as great without the help of ORAU’s fantastic staff, my wonderful family, and the gracious Rocky Hill volunteers. Even though most of the day is a blur, I am going to try to give an account for the memorable day. – From the start of the day, everyone was working hard to help make the reveal special. It reminded me of my wedding. People asking if I needed anything or if they could do something for me. People were constantly moving all around to set up decorations and stations. – Right after everything had been set up, we had a a couple of minutes before the volunteers were going to arrive. During those minutes, I got to experience a great calmness. It was a moment I had been waiting and preparing for. It was really nice to look around and everything was done! – Right before the students yelled move that bus, I was frantically trying to get the oovoo (skype) to connect with my teacher friend from France, Mrs. Calard. It was going to be the main kick-off, and it was not working. But as soon as I heard the students yell, “MOVE THAT BUS!” I realized it didn’t matter and the students would still enjoy the day. A couple of minutes later it started to work and everything went fine. – Seeing the students’ faces as the ran in was priceless. I spent the majority of my summer either working in my room or thinking about the makeover so it was really nice to finally see the kids’ reactions. 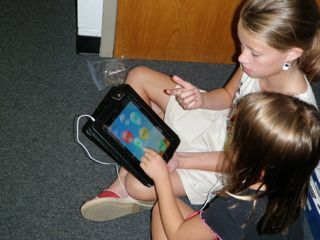 – One of my favorite moments was just walking around the room and watching the students interact with all the different technology. I have been second guessing my decision with splitting the hardware into different types, and have been wondering if I should have gone with just all laptops. But, it all changed when I watched them play with the iPad. There is just something about it that lures people to it. – I really enjoyed watching Dr. McIntyre and Mr. Smith playing with the students. Both men are extremely busy, and it was nice to see them relax for a moment and interact with some of the stations. – Family! My family has been very supportive through this whole process. Espically my wife. I can not count the number of hours she has spent listening to me talk about school. She is always there to listen and give advice. She is my rock, and I was glad she was there to lean on during the day. My mother also cried about 20 times during the day. – The TV interviews were a blast. I was extremely nervous but I enjoyed pretending to be important. When I watched the interviews later that night, it was very surreal to think that was actually me. – It was bittersweet. I was really happy for the students to have that moment. They worked really hard and they are the ones who won that money. I was glad they got to use it for a couple of hours but it was bittersweet because it would be their last. I got to be their teacher for one more lesson and that meant the world to me. I will be forever grateful for ORAU for giving me this day. They have already made so many of my dreams come true and the school year doesn’t even start until next week. After yesterday, I am even more excited about this year and what we are going to do because of the gracious giving of company who truly cares about their community.